The ScanGauge product line integrates advanced Trip Computers, Digital Gauges and an easy to use Scan Tool in a small and compact package design to fit almost anywhere. $159.95 Click for price What's this? The ScanGaugeII features the exclusive X-Gauge™ programmable gauge system and the all new Performance Monitor™, while the ScanGaugeE provides a real-time fuel economy feedback graph and built-in CO2 footprint gauges. ScanGaugeII can help you monitor your vehicle’s most vital systems and provide the kind of real-time information you’ve been missing. Features include more than 15 built-in digital gauges, 4 trip computers and an easy-to-use ScanTool that shows both set and pending trouble codes — All in an ultra compact design that installs in minutes. The ScanGaugeII features the exclusive X-GAUGE™ programmable gauge system; you can monitor parameters such as transmission temperatures†, trip data and fuel economy information. X-Gauge™ gives you the ability to customize your ScanGaugeII by adding additional vehicle specific digital gauges. The ScanGaugeII features the all new Performance Monitor™ for real-time performance measurements. The Performance Monitor gives your the ability to track your vehicles performance over short periods of time, distance and acceleration. The US government has put out a report that says driving habits can change fuel-economy by up to 33%. ScanGaugeII provides real-time data about your vehicle’s instant and average fuel economy, fuel used, cost of fuel used for each trip, cost per mile, gallons per hour and more! ScanGaugeII can help you diagnose and trouble-shoot problems by providing real-time data about your vehicle’s performance. In addition, ScanGaugeII will display captured trouble codes and conditions when the problem occurred. With the ScanGaugeII you can “pull the codes”, make your own repairs and turn off warning lamps just like the Pros. ScanGaugeII provides real-time gauges to show you what is going on “under the hood” so you can catch issues early before they become more expensive problems. ScanGaugeII installs in just minutes without tools and does not require batteries or an external power source. All data and power are derived from the single OBDII connection. The detachable six (6) foot cord also allows ScanGaugeII to be mounted just about anywhere on the dash or console while staying connected to your vehicle. Below are just a few examples. Works On All OBDII Protocols: Including CAN, required on all vehicles starting in 2008. 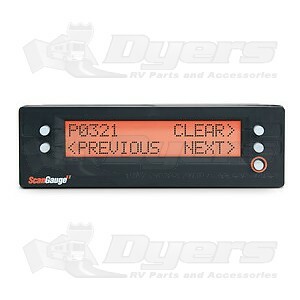 I use the Scanguage to monitor the check engine light on my MB motorhome. I use the Scanguage to keep track of my fuel use under various driving conditions, and to turn off unwarranted check engine lights. This device saved me when my radiator fan broke and I was able to keep an eye on the water temp and transmission temp to make sure it stayed under a certain temperature. When it was over, I pulled over and rest. This was my trip around the US. I've been meaning to purchase a Scan Gauge II for years and finally chose this website for the lowest price. The Scan Gauge II is just two pieces - the interface cable and the device. A word of warning: the Velcro pieces that come with the product do not attach to a standard slick dashboard surface, you will need to make the decision on whether or not to use permanent super glue on the Velcro strip on the dashboard to keep it in place. The long (3') cable is also a hazard while driving if you do not use additional Velcro strips (with super glue again) to keep it out of the way. You can change the background color of the display so it does not conflict with the tint of your sunglasses, and so it is easier to read at night. I have a 2002 VW Jetta TDI, so I did need to adjust the Scan Gauge II settings quite a bit. I am getting 43-44 MPG according to the tank-to-tank spreadsheet I have. The Scan Gauge II was recording my speed incorrectly, and the MPG was 12-20 below what I recorded. After the second diesel ("a") fill-up and several adjustments the device is recording 39 MPG. My biggest problem with the Scan Gauge II is that if you are coasting uphill or downhill with your foot off of the accelerator you will get a large negative number (-1,200 to -3,000 MPG). This is going to make your MPG inaccurate. I'm only on my third tank of diesel while using the Scan Gauge II, so I'm still learning how to use the device. It has made me change the way I drive, since I can see the instantaneous drop in MPG going uphill on cruise control or stomping the accelerator. Just be prepared to spend several days adjusting the Scan Gauge II to your vehicle. The Scan Gauge II registers only what you have coming from the interface device - the MPG according to the data. It does not record additional gain or loss of MPG from drafting behind large semi trucks or the aforementioned coasting. But since car manufacturers do not include a MPG display on their dashboards, the Scan Gauge II is worth the cost for that ability. I have yet to use the device for looking at engine codes. I received the unit quickly and plugged it into my 2007 Tundra. It powered up but would not connect to the ECU. Tried all the bus protocols. Moved it to the 96 Lexus and 04 4Runner and connected instantly. I worked with Cristina at Linear Tech Support - tried what she asked - still did not work in the Tundra. She shipped out a new unit with a new cable assy - voila! Worked right away. They sent a return postage sticker to send back the first unit. A week later I got back the original cable - thats good customer service. The Tundra uses CANSF protocol and a different cable. I programmed up the Xgauge ATF temp and it works well - allowed me to change the ATF. The MPG and total fuel cost is very useful also. So if you get one and it does not work right away - dont panic or get mad. Cristina at Linear will take care of you! The ScanGauge II delivers on all its functions and does not over hype its capabilities. I would like to see a gauge with a larger display and graphical output but realize that I would be paying more for the same information I am now getting with this unit.